Highway Mazda is the newest name in town! New Owner Ron Loeppky took charge of the already established Mazda Dealership in Steinbach MB, previously Auto City Mazda, in January 2013. He decided to give the dealership a New Name, to reflect the change that was happening. Walking into Highway Mazda, you will notice the New Attitude! Mazda has been in Steinbach MB since 1989, previously owned by Don Neufeld. Over the years, Mazda has grown in its current location, as we now offer a state-of-the-art showroom, Parts & Service Centres and a Finance Department. 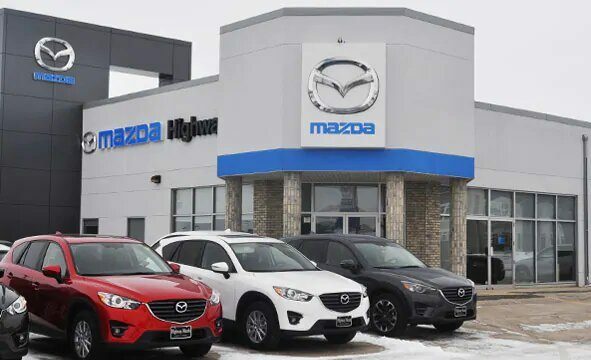 Whether you are in need of a New Mazda or used vehicle, parts / service for your current vehicle, Highway Mazda of STEINBACH is here to assist you with any of your automotive needs! At Highway Mazda, we look forward to serving you, our valued customer, for years to come. Come see the difference New Owners, a New Name, and New Attitude make. Please stop by our dealership, located at 101 Hwy 12 North, STEINBACH, MB and speak with one of our representatives today!